SÃO JOSÉ DOS CAMPOS, Brazil, Jan. 24, 2019 /PRNewswire/ -- Embraer S.A. ("Company" or "Embraer"), in addition to the Material Facts disclosed by the Company on December 17, 2018 and January 10, 2019 ("Material Facts"), hereby informs that in light of the favorable pronouncement from the Brazilian Federal Government regarding the strategic partnership between Embraer and The Boeing Co., in accordance with the terms disclosed in the Material Facts (the "Transaction"), the Company's Board of Directors, on the date hereof, decided (i) to ratify the resolution of December 17, 2018 that approved the Transaction; (ii) to authorize the execution of the Master Transaction Agreement, which provides the terms and conditions for the consummation of the strategic partnership in connection with the commercial aviation, the Contribution Agreement, which provides the terms and conditions for the creation of a joint venture for the promotion and development of new markets and applications for the multi-mission airplane KC-390, as well as of the other agreements and documents necessary or convenient for the consummation of the Transaction; and (iii) to authorize, after the approval of the Transaction by Embraer's shareholders, the executive officers to perform any act necessary for the consummation of the Transaction, including the transfer to the new company of the net equity comprised by assets, debts, properties, rights and obligations related to the commercial aviation business unit. SAO JOSE DOS CAMPOS, Brazil, Jan. 16, 2019 /PRNewswire/ -- In accordance with CVM Instruction 358 of January 3, 2002, Embraer announces that it has revised its guidance for 2018 and is presenting projections for 2019 and 2020. As a result of the reduction in executive jet deliveries, the Company now expects revenues in the executive jets segment to be approximately US$ 1.1 billion (previously US$ 1.35 billion – US$ 1.50 billion). In addition, the cost base revision for the KC-390 contract in the second quarter of 2018, resulting from the incident involving prototype 001 in May 2018, negatively impacted revenues for the Defense & Security segment. This impact led to a new projection for revenues for the segment, of approximately US$ 0.6 billion (US$ 0.8 billion – US$ 0.9 billion previously). As a result, Embraer's consolidated revenues for 2018 are now expected to be approximately US$ 5.1 billion, a reduction from the previous range of US$ 5.4 billion – US$ 5.9 billion. SÃO JOSÉ DOS CAMPOS, Brazil, Jan. 11, 2019 /PRNewswire/ -- Embraer S.A. ("Company" or "Embraer"), in addition to the Material Facts disclosed by the Company on December 17, 2018 and January 10, 2019 ("Material Facts"), hereby informs that in light of the favorable pronouncement from the Brazilian Federal Government regarding the strategic partnership between Embraer and The Boeing Co., in accordance with the terms disclosed in the Material Facts (the "Transaction"), the Company's Board of Directors, on the date hereof, decided (i) to ratify the resolution of December 17, 2018 that approved the Transaction; (ii) to authorize the execution of the Master Transaction Agreement, which provides the terms and conditions for the consummation of the strategic partnership in connection with the commercial aviation, the Contribution Agreement, which provides the terms and conditions for the creation of a joint venture for the promotion and development of new markets and applications for the multi-mission airplane KC-390, as well as of the other agreements and documents necessary or convenient for the consummation of the Transaction; and (iii) to authorize, after the approval of the Transaction by Embraer's shareholders, the executive officers to perform any act necessary for the consummation of the Transaction, including the transfer to the new company of the net equity comprised by assets, debts, properties, rights and obligations related to the commercial aviation business unit. SÃO JOSÉ DOS CAMPOS, Brazil, Jan. 10, 2019 /PRNewswire/ -- Embraer S.A. ("Company" or "Embraer"), in addition to the Material Fact disclosed by the Company on December 17, 2018 ("Material Fact"), hereby informs that, on the date hereof, the Brazilian Federal Government expressed its approval of the strategic partnership between Embraer and The Boeing Co., in accordance with the terms disclosed in the Material Fact (the "Transaction"). The Transaction will only be consummated after the (i) ratification, by the Company's Board of Directors, of the resolutions taken on December 17, 2018 and authorization to execute the Master Transaction Agreement, the Contribution Agreement and the other documents to be entered into in connection with the Transaction; (ii) resolution and approval of the Transaction by Embraer's shareholders at an Extraordinary Shareholders' Meeting; (iii) approval by antitrust authorities from Brazil, the United States of America and other applicable jurisdictions; and (iv) satisfaction of other conditions customary in similar transactions. SAO JOSE DOS CAMPOS, Brazil, Dec. 26, 2018 /PRNewswire/ -- Further to the Material Fact of December 20, 2018, Embraer S.A. ("Company") hereby informs its shareholders and the market that, on December 21, 2018, the Chair of the Federal Court of Appeals (3rd Region) revoked the injunction granted in the Public Civil Action n. 5031433-18.2018.4.03.6100, filed before the 24th Federal Civil Court of São Paulo ("Public Civil Action"). The Company will keep its shareholders and the market informed on any material developments related to the Public Civil Action. (d) the formation, as part of the Transaction, in addition to the Commercial Aviation JV, of another joint venture between Embraer and Boeing for the promotion and development of new markets and applications for the multi-mission airplane KC-390, based on opportunities to be identified together, and development, manufacture and sales of the KC-390 ("KC-390 JV"), which will have Embraer as the controlling party. 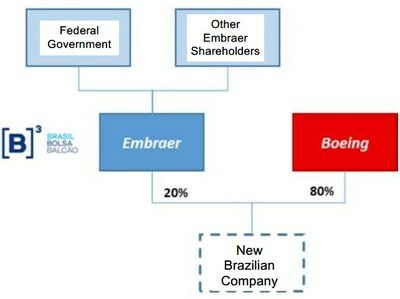 (ii) Authorized the delivery of a notification requesting the prior approval of the Transaction by the Brazilian Federal Government, by virtue of the common share of special class issued by Embraer owned by the Federal Government (golden share), pursuant to Article 9 of the Company's Bylaws. The main changes to the facts and premises informed in the Initial Material Fact are described below. The value attributed ("Enterprise Value") by the parties involved in the Transaction to the Commercial Aviation JV (considering that the New Company will hold 100% of the commercial aviation business, including the corresponding operations, services and engineering capacity) is US$ 5.26 billion. Boeing Brazil will acquire an 80% interest in the total and voting share capital of the Commercial Aviation JV at the closing of the Transaction, which will include the subscription of new shares by Boeing Brazil and the acquisition of existing shares directly from Embraer, at an aggregate value of $4.2 billion (the "Estimated Value"). Embraer expects the Transaction's proceeds net of separation costs to equal approximately US$3 billion. Any reductions to the separation costs up until the Transaction's closing date would be shared by Embraer and Boeing equally. The Estimated Value is also subject to adjustments customary for transactions of the same nature including for indebtedness and net working capital of the New Company at the closing date of the Transaction. It is not possible at this time to determine the net effect of the Transaction on the Company's results. As informed in the Initial Material Fact, the Company will have the right to sell its interest in the Commercial Aviation JV to Boeing through the exercise, at any time, of a put option ("Put Option"). If Embraer exercises the Put Option before the expiration of the Lock-Up Period (defined below), the price per share to be paid will be equal to the price per share at the closing date of the Transaction, adjusted by the inflation (in the U.S.) accumulated between the closing date of the Transaction and the date the Put Option was exercised, or if the Put Option is exercised after the Lock-Up Period, the price per share will be equal to the fair value of each share object of the Put Option at the respective exercise date. As part of the Transaction, in addition to the Commercial Aviation JV, the KC-390 JV will also be formed by the Company and Boeing. The KC-390 JV, which will be controlled by Embraer, will have Boeing as the holder of 49% of the share capital and Embraer as the holder of 51% of the share capital. 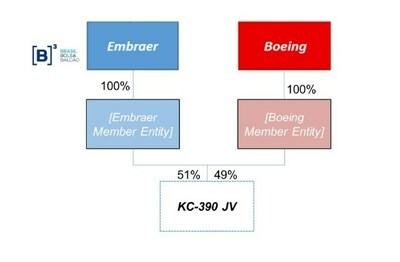 Subject to the terms and conditions set forth in the KC-390 JV agreements: (i) Embraer and Boeing will collectively make contributions, in cash and in assets; (ii) Embraer will allow KC-390 JV to access information required for KC-390 JV to operate its business; and (iii) certain long-term operating contracts will be entered into by the KC-390 JV. With the implementation of the Transaction, the Company will remain a Brazilian public listed company, registered in Category A, and with shares listed in the Novo Mercado special segment of B3 S.A. - Brasil, Bolsa, Balcão. The Federal Government will remain with the rights deriving from its ownership of the common share of special class issued by the Company (golden share), as set forth in the Company's Bylaws. The defense & security and executive jets businesses, among others, will not be segregated in favor of the New Company and will continue to be developed and performed by Embraer. The New Company will be a closely-held company with operations and headquarters in Brazil. The New Company will be managed by a Board of Officers and a Board of Directors, both bodies composed of professionals with appropriate qualifications to occupy their respective positions, and Boeing's control of the New Company is ensured. The Company will have governance and veto rights in certain matters, subject to the terms and conditions to be established in the definitive documents. The New Company will have an anti-dilution policy and a dividend policy, in order to protect the Company's investment in the New Company. Also, in order to align the interests of the parties in the partnership resulting from the Transaction, as a general rule, the Company and Boeing will not be able to dispose of their respective shares issued by the New Company for a period of 10 years from the closing of the Transaction ("Lock-Up Period"). In addition, the definitive documents will establish rules for the transfer of shares, including a right of first offer, tag-along right and drag-along right, subject to the Lock-Up Period, as well as other customary terms for transactions of this kind. Until the effective implementation of the Transaction, both parties will conduct their respective businesses completely separate and independent of each other. Therefore, customers, suppliers, employees and other third parties should not expect any change in the composition of management, business relations, supply and offer of products during this period as a result of the Transaction. As anticipated, however, the Transaction will only be consummated after (i) approval by the Brazilian Federal Government, including due to the ownership of the common share of special class issued by the Company (golden share), pursuant to Article 9 of the Bylaws; (ii) ratification by the Board of Directors, also pursuant to Article 9 of the Bylaws; (iii) authorization by the Board of Directors to the Board of Officers for purposes of the execution of finalized agreements related to the Transaction; (iv) deliberation and approval of the Transaction by Embraer shareholders at an Extraordinary General Meeting; (v) approval by antitrust authorities from Brazil, the United States of America and other applicable jurisdictions; and (vi) satisfaction of other customary conditions. Therefore, it is not possible at this moment to guarantee the consummation of the Transaction. The Company will keep its shareholders and the market in general informed of any new relevant step concerning the Transaction. The Company has been advised by the following firms in connection with the Transaction: Barbosa Müssnich Aragão – BMA, Skadden, Arps, Slate, Meagher & Flom LLP, Citibank, McKinsey A.T. Kearney and KPMG.